Karl Steam is a children’s author, illustrator, and motivational speaker. Some of his works include Purple Pup, How Santa Changed, and Bear Woke Up. He resides in the Lakes Region of the Upper Midwest, with his wife and three children. Karl enjoys fishing, camping, and traveling. The coastlines of Wisconsin and Michigan are currently at the top of his vacation wish list. Mrs. Claus likes to bake cookies, but they’re always burnt. Santa likes to make toys for all the children of the world and he delivers them on Christmas Eve. His sleigh is so full, it took a mighty moose to pull it around the world. As the world grew, with more children and higher skyscrapers, Santa’s task of making toys for every child became overwhelming for just one person to do. The sleigh was too heavy for just one moose, so he added another. Only the moose didn’t get along and Christmas was in jeopardy until Santa found a herd of reindeer. Santa knew his task was no longer one he could do on his own. Changes had to be made and, in making them, Mrs. Claus’s cookies improved, so much so that Santa was eating them – a lot! Change is never easy, but even Santa realized that he had to make some changes in his life and work. Karl Steam’s Christmas picture book story, How Santa Changed, is a delightful, rhyming story much in character with the ever popular poem, 'Twas the Night Before Christmas, by Clement Clarke Moore. 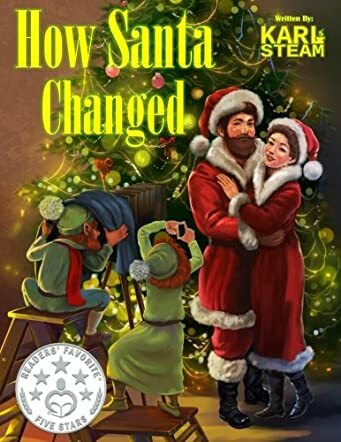 How Santa Changed will also answer some of the age-old questions that children always ask, like why Santa uses reindeer and why he needs elves to help him make all the toys. And the ever famous question: why is Santa so big and jolly? This is a classic for any child’s Christmas bookshelf, a favorite that will be pulled out again and again to share with all generations of children.